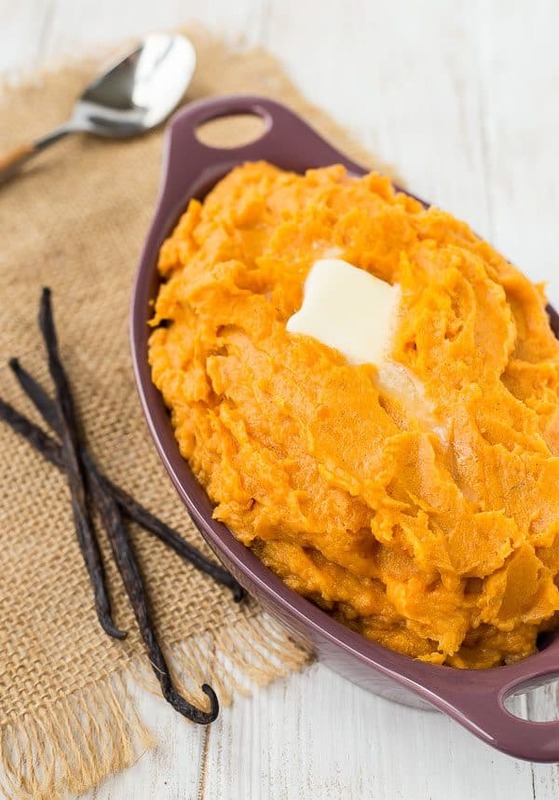 Creamy and sweet, these vanilla bean mashed sweet potatoes taste like dessert! 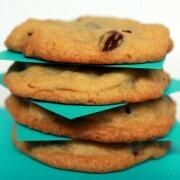 They’re so easy to make and will become a quick favorite! 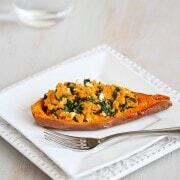 On Monday, I promised you an amazing sweet potato recipe that Ben RAVED about and this is it! 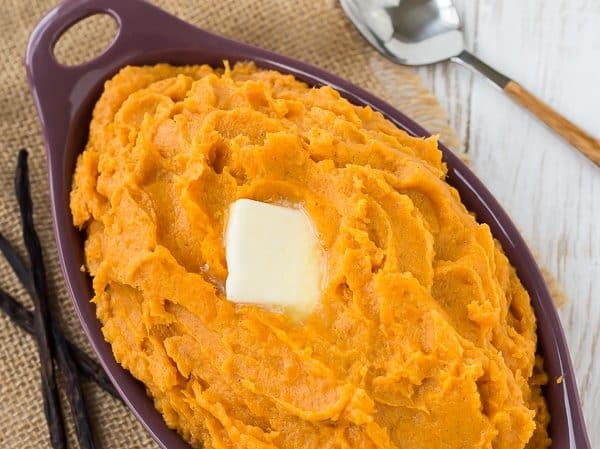 He’s typically not a sweet potato fan, but after one bite of these mashed sweet potatoes, he couldn’t stop talking about them! He said they tasted like cake. Thanks, vanilla beans! 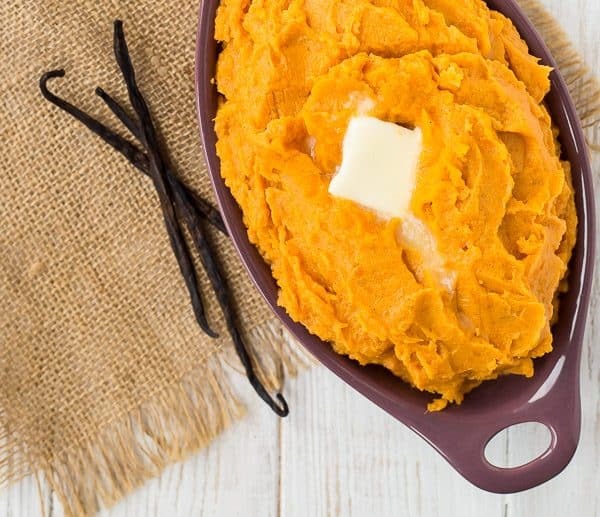 They are responsible for the beautiful sweetness of these mashed sweet potatoes. Well, vanilla bean paste, plus a little brown sugar. However, brown sugar aside, you’ll be amazed by how sweet these potatoes taste with just a touch of brown sugar. Tip: Want to jazz these up even more? Try adding nutmeg or orange zest – see recipe for details! These are absolutely perfect when you want to spruce up your normal sweet potato game, but they really should be destined for your Thanksgiving table. Especially if you’re not into the usual marshmallow situation. These fulfill that need for sweet sweet potatoes (the double sweet there wasn’t an accident!) as part of your Thanksgiving dinner. If you’re making these for Thanksgiving, I’d recommend prepping by cooking your sweet potatoes a day in advance and popping them in the fridge. In fact, you could prepare this dish in full a day in advance and then all you’ll need to do is heat it through. In the recipe, I describe a few methods of heating it: Slow Cooker, Microwave, or Oven. I prefer the oven but any and all will work great! Tip: Need a great way to cook the sweet potatoes before mashing them? 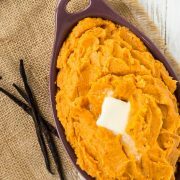 Try making Instant Pot sweet potatoes! Combine all ingredients. If desired, use a hand mixer to achieve a smoother texture. Spray the inside of a slow cooker with nonstick cooking spray and add the sweet potatoes. Heat on low for 2-3 hours or until heated through. Heat in microwave for 3-4 minutes, stirring 2-3 times, until heated through. Heat in a covered glass baking dish in the oven at 325 degrees Fahrenheit for 45 minutes or until heated through. 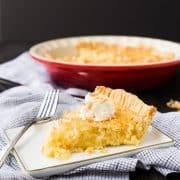 Note: Instead of vanilla bean paste, you may also use 1 tablespoon of vanilla bean extract and the pulp (seeds) of two vanilla beans. Note: I like to cook my sweet potatoes in my Instant Pot. Note: I like these as is, but fun possible add-ins could be freshly grated nutmeg (1/2 teaspoon) or orange zest (1 teaspoon). Note: Makes eight 1/2 cup servings. Verdict: I loved these mashed sweet potatoes and they might just be making an appearance on my Thanksgiving table. Husband’s take: Ben, not being a sweet potato fan, said these were the best sweet potatoes he ever had. I’d call that a win! Changes I would make: I like these as is, but fun possible add-ins could be freshly grated nutmeg (1/2 teaspoon) or orange zest (1 teaspoon). I love vanilla bean paste. 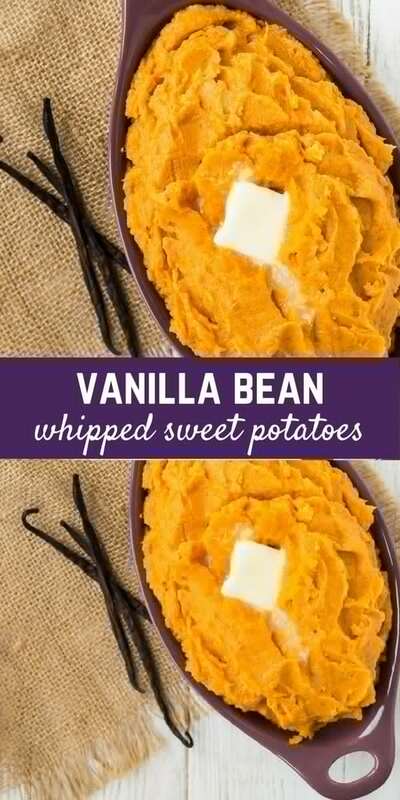 Such a fun addition to sweet potatoes. 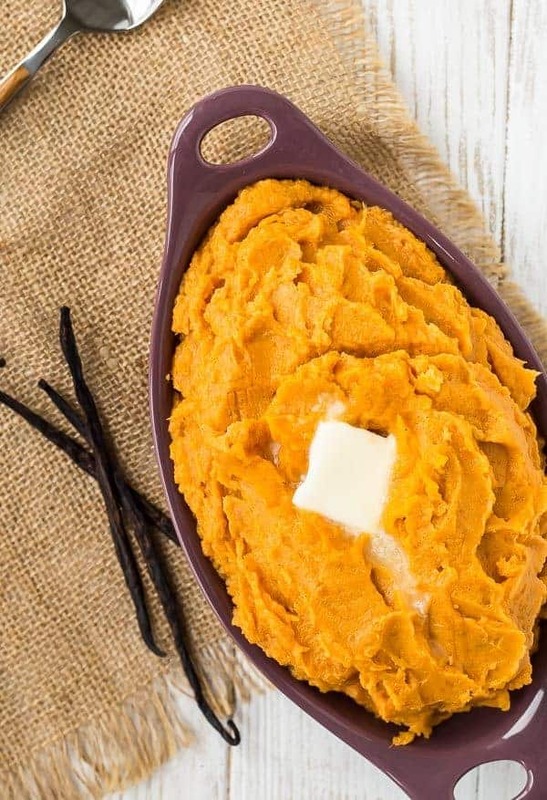 Thanks for sharing my sweet potato recipe!